Admin Express can be edited for the page appearance, but most functionality is controlled through the web server or the Administration Server configuration and should be edited through those servers, not by editing the configuration files directly. The directories for all of the Admin Express configuration files are listed in Table F.1, “Admin Express File Directories”; the specific files are described in each section describing the different Admin Express page configurations. /etc/dirsrv/admin-serv/ Contains the local.conf, httpd.conf, and other configuration files which define the Administration Server and configure the web server. 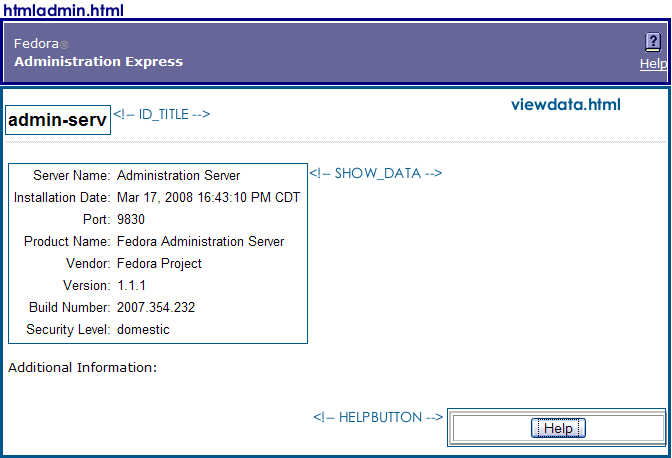 /usr/share/dirsrv/html/ Contains the HTML files and graphics used for the Admin Express appearance. The behavior for Admin Express is mostly set through the web server configuration and should not be edited. 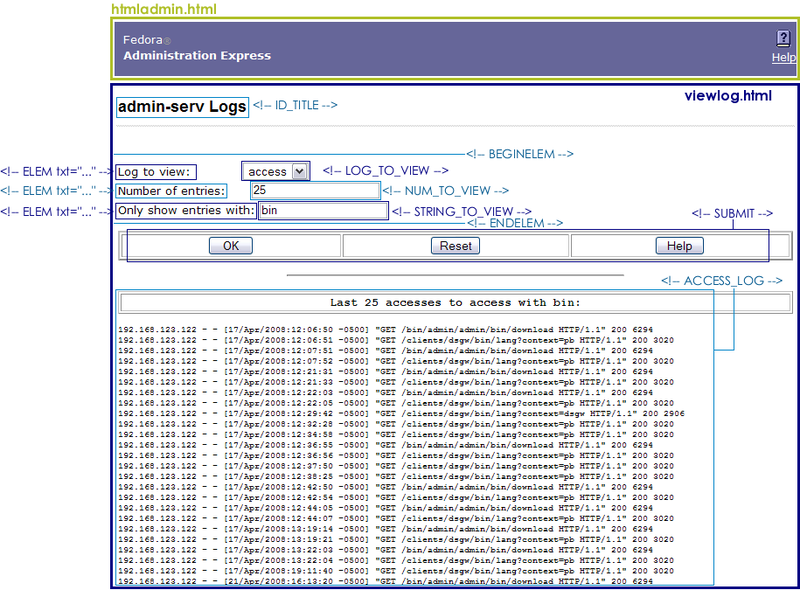 The other Admin Express configuration is set through directives which insert data or form fields. There is not cascading style sheet (CSS) file to centralize the formatting for pages in Admin Express. All formatting is done inline with the tags or through <style> tags in the page head. For information on editing inline tags, see http://directory.fedoraproject.org/docs/389ds/administration/htmlediting.html. 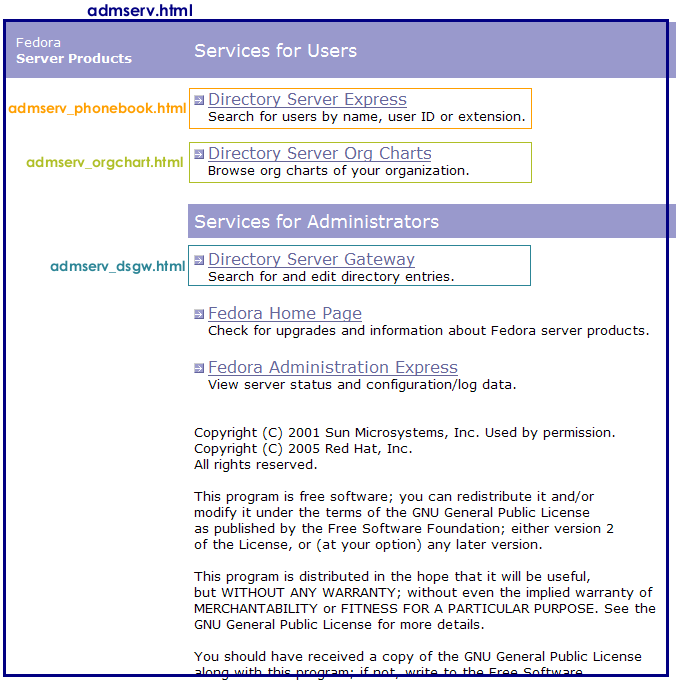 The configuration files for the introductory page for Admin Express is located in the /etc/dirsrv/admin-serv directory. One file sets the formatting, copyright text, and some web application text, admserv.html. All of the formatting for the page is set inline. The text files are inserted using the INCLUDEIFEXISTS directive. The text files themselves have inline formatting for the inserted table rows. The viewdata.html file is very simple, using only the two directives to insert the server data, plus other directives to insert other information. For the Administration Server, the SHOW_DATA directive takes the information from the /etc/dirsrv/admin-serv/local.conf file. For the Directory Server, it takes the data from the /etc/dirsrv/slapd-instance/dse.ldif file. The ID_TITLE is the name of the server instance. The Admin Express directives are HTML comments that are interpreted by the CGI scripts; these directives are used to set form fields and to pull data from the server configuration and log files.